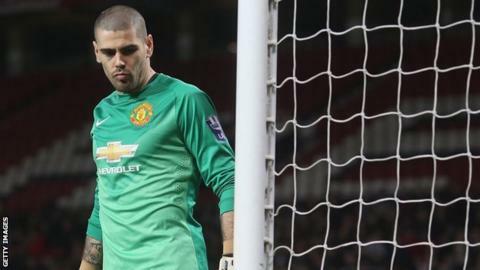 Manchester United goalkeeper Victor Valdes is expected to sign for Belgian club Standard Liege until the end of the season. Valdes, 34, signed an 18-month contract when he joined United a year ago. However, the former Barcelona and Spain goalkeeper has featured just twice for Louis van Gaal's side. He was left out of the club's pre-season American tour with Van Gaal claiming the keeper had refused to play in a reserve game. Valdes, who won the Champions League three times with Barca and was part of the Spain squads that lifted the 2010 World Cup and Euro 2012 trophies, has not trained with United's first team since his fall out with the manager. And, after a proposed move to Besiktas fell through in August, the player's agent indicated Valdes would move on in January.